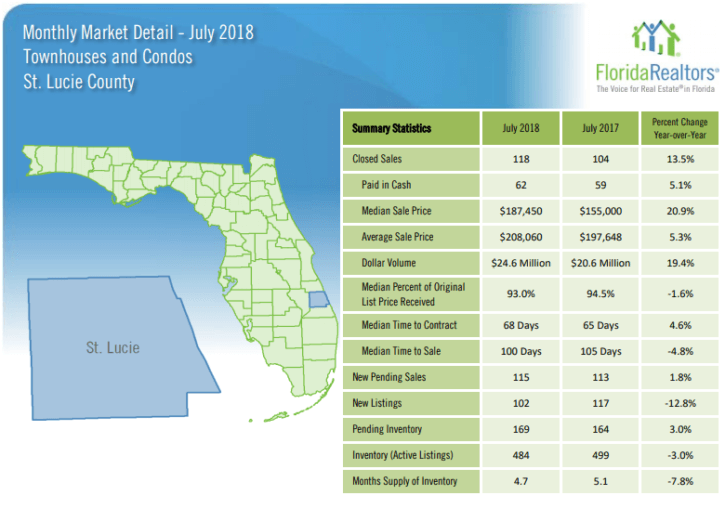 TheSt Lucie County Townhouses and Condos July 2018 Market Report showed better sales activity when compared to last year and remains as an active market. Closed sales were up by 13.5% from last year (was down by 18.7% in June) while new pending sales were up by 1.8% for July (was down by 2.4% in June). Prices, though, rose for the month. The median price increased by 20.9% from last year (was down by 16.6% in June) while the average sales price increased by 5.3% (was down by 6.3% in June). The inventory of available townhouses and condos decreased by 40 units from last month to 484 units, which is 3.0% less than July 2017. The current supply is 4.7 months, which is 7.8% less than the 5.1 months of inventory last year. The St Lucie County townhouses and condos market continues to be a seller’s market though it appears to be drifting towards a balanced market. Typically a 6 to 7-month inventory is considered a balanced market showing no advantage to either buyers or sellers.